If you are still one of the thousands of homeowners whose mortgage loans are underwater, you can attempt to get relief has HARP Refinance 2.0 has been extended through 2016. 2016 HARP Refinance 2.0 or the Home Affordable Refinance Program is officially extended per the statement released by the Federal Housing Finance Agency. Even thought a lot of people have taken advantage of using HARP to refinance their upside-down mortgages (mortgages where there is more owed than it is worth) it was still determined that 2016 HARP was necessary. If homeowners wasted time and thought they were out of time to refinance they now can thanks to 2016 HARP Refinance 2.0. Quite frankly, a lot of borrowers were holding out hope that their properties would gain enough value to offset the mortgage owed, but the values just haven’t increased that much yet. Since the launch of HARP back in 2009, this has been a major hit amongst homeowners who realized were in trouble and were given a lifeline. Over 3 million homeowners so far have taken advantage of HARP and it is expected that 2016 HARP Refinance 2.0 will assist thousands more as there isn’t a guarantee that this program will be extended again. Originally HARP Refinance 2.0 was scheduled to expire on December 31, 2013 but has now been extended 3 times. Under 2016 HARP Refinance 2.0 the borrower can benefit in many ways including: Lowering monthly payment, reducing interest rate, securing a fixed-rate mortgage (for borrowers currently in adjustable-rate mortgages or ARMs), building equity faster (refinancing to a shorter term), and lower closing costs since an appraisal is not required. There are many program features associated with 2016 HARP Refinance 2.0 and additional information can always be found www.harp.gov. – Borrowers will now be able to refinance regardless of how far their homes have fallen in value. Previous loan-to-value limits were set at 125 percent. – Most homeowners will not have to get an appraisal or have their loan underwritten, making their refinance process smoother and faster. – Certain risk-based fees for borrowers who refinance into shorter-term loans have been reduced. – Lenders now need less paperwork for income verification, and have the option of qualifying a borrower by documenting that the borrower has at least 12 months of mortgage payments in reserve. – The end date to get a HARP refinance is December 31, 2016. – You are current on your mortgage, with no 30 day+ late payments in the past 6 months no more than one late payment in the past 12 months. So if you are looking for an experienced lender with processing a refinance through 2016 HARP Refinance 2.0 you are in the right place. I am available any time day or night at 888-900-1020 or feel free to visit my website for all your information needs www.loanconsultants.org. IF you were currently prevented from using the Home Affordable Refinance Plan or HARP due to your high loan-to-value (LTV) ratio, you may be in business come the end of this year. Even given the recent increases in mortgage rates since the Presidential Election, Freddie Mac is still predicting that 2017 will end with mortgage rates in the 4’s. Given these thoughts the Federal Housing Finance Agency or FHFA has a 2017 New Underwater Refinance Program that will take the place of HARP moving forward. Around October 2017, this new program will be rolled out as determined by Fannie Mae and Freddie Mac who oversee the FHFA. With this new “High-LTV” program, it will be similar to HARP, but it will do its best to remove some of the restrictions that are currently preventing homeowners from refinancing in the first place. With rates predicted to stay lower over the next year, this could mean the 2017 New Underwater Refinance Program can have a high rate of success and usage by the borrowing public. Recently, the Federal Housing Finance Agency or FHFA, came out and extended the existing HARP program until September 30, 2017 at which time this program will likely be gone forever and the 2017 New Underwater Refinance Program will take its place. HARP was originally debuted in 2009 after the Great Recession and housing market collapse when home prices tanked and a lot of borrowers owed a lot more than their homes were worth. 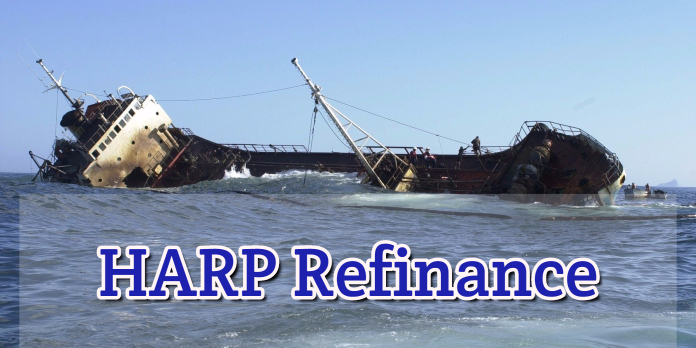 As rates were declining HARP was designed to allow for the refinance of these “underwater” loans when under normal circumstances there would be no way to refinance by typical refinancing guidelines. HARP received a lifeline to even be an active program in 2017 as it was originally scheduled to end 12/31/2016. When looking at the data and seeing that there were still more than 250,000 eligible borrowers to take advantage of HARP, FHFA decided it would be wise to extend the program just a little longer until September 30, 2017. If you still don’t qualify for HARP currently, this is where the 4th quarter of 2017 will help you out with the 2017 New Underwater Refinance Program. Another rumored guideline which is extremely beneficial to borrowers is that this process may only require limited documentation. Now it is not known what exactly is meant by this, but you could see getting this refinance done without W2s, tax returns, and bank statements. With this not being set in stone it is prone to change, but we shall see once the full regulations have been released. As we move on throughout the year, we will definitely be keeping an eye on this and doing our best to get borrowers through this new refinance program. If you’d like to give me a call, we can go over your current situation and plan on getting you refinanced under this new program if you aren’t currently HARP eligible. However, if you are HARP eligible, we can take care of you as well, just give us a call as we are available 24-7 to help you out. Days, nights, weekends, holidays don’t matter to us as we will be available when you need us. Reach out today at 888-900-1020 and we can get a customized plan and loan ready for you. We look forward to hearing from you soon!